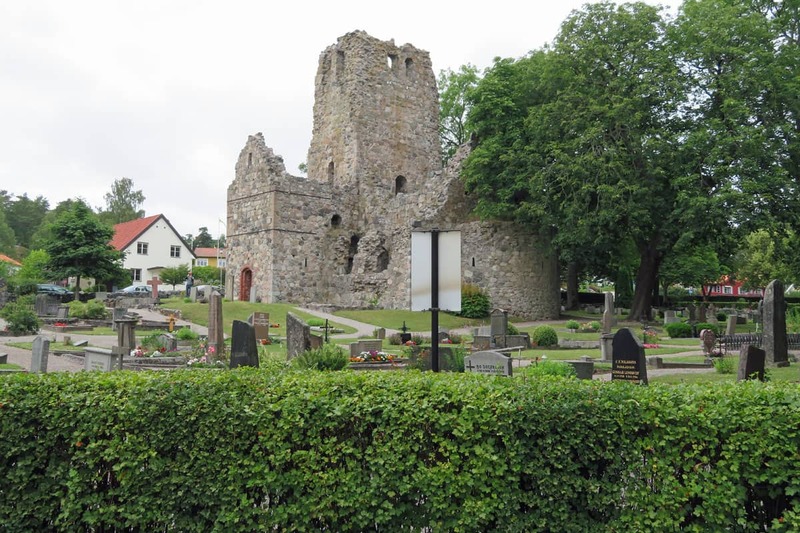 Sigtuna has the ruins of three different churches still standing. Vikings were once powerful masters of the seas. Their ship building skills were superior, enabling them to sail oceans that Europeans from other countries couldn’t. Since the days I studied history at school, we’ve even discovered that the Vikings visited Canada and established a settlement in Newfoundland, a full five centuries before Columbus discovered North America. When it comes to travel bucket lists, getting to the Viking homeland has long been at the top of mine. So, when the TBEX (Travel Bloggers Exchange) European conference in 2016 was announced for Sweden, David and I signed up immediately. 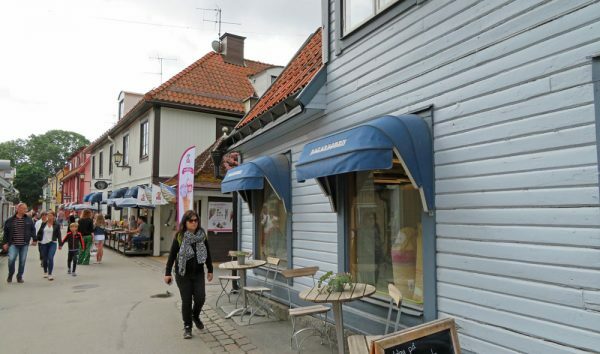 Then, for our complimentary pre-TBEX tour, we selected Sigtuna, Sweden’s first town. Sigtuna is situated less than an hour’s drive from Stockholm, making it a great day (or overnight) trip. You can also take the train, which is one of the most popular ways to get around the country. Farm along the highway between Stockholm and Sigtuna. Roadtrips are always great ways to get a feel for a country’s changing landscape. Sigtuna, while not on the coast, is situated on the Bay Skarven, which stretches around Upplands-Bro and is part of Lake Mälaren. So you’ll find everything from beaches to fishing. Inland, Sweden has lots of forests and farmland, much like I’m used to on the Saskatchewan prairies. And while most of the barns here are red, it was a little surprising to see farms with the barn, house, and all the outbuildings also painted red. Learn more about why so many buildings are red. The tradition of painting all of the buildings red started in about 850 AD. Why? Because they started mining Stora Kopparberget (= the Great Copper Mountain), in today’s city of Falun. While mining devastated nearby areas with its sulphur smell, the red dust created from leftovers of the mine still became popular. 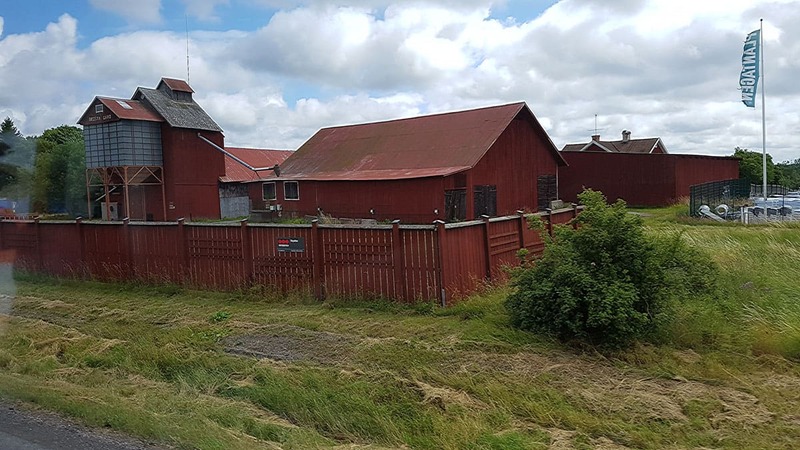 Today, the paint is called Faluröd and and contains the tailings (leftover minerals after the ore is collected) along with water, linseed oil and rye flour. The mine was able to make additional money by turning the red dust into paint, instead of having to dispose of it elsewhere. Red was also predominant in Sigtuna, with many red clay brick roofs and red brick structures. 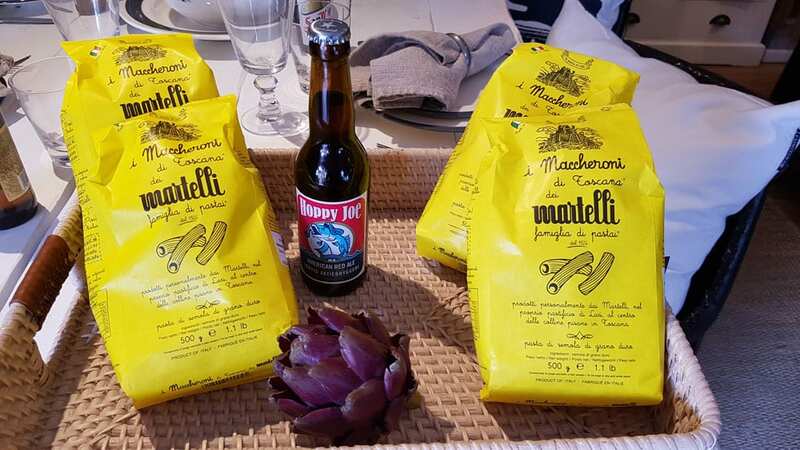 In fact, the shopping area and the local market turned out to be a great example. 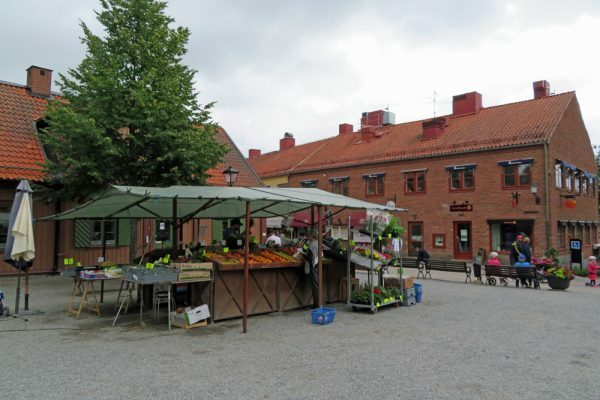 Shopping and Market Center in Sigtuna, Sweden. What better place to look for Vikings than at the Sigtuna Museum? In fact, our costumed tour guide, Eva, was a descendant. 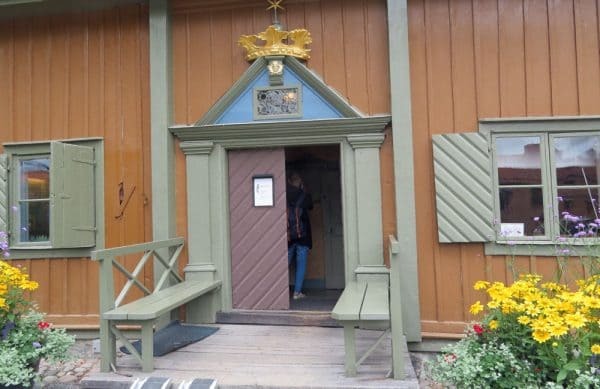 The museum is built on the location believed to be the home of the first Swedish King, Eric the Victorious. In fact, he was a guy who fit the image of the Viking well, claiming both Kingship and a country by creating coins with his face on them sometime around 970 or 980 AD. It wasn’t, however, much of a land base at that time, consisting mainly of the area around Lake Malaren and Lake Vattern. From Eric the Victorious’s first settlement through the next few centuries, Sigtuna was important in the Norse mythology of the Vikings. Both a governing and trading center, Sigtuna’s strategic location at the waterway to Old Uppsala and the “Temple at Uppsala,” made this period the town’s most important. 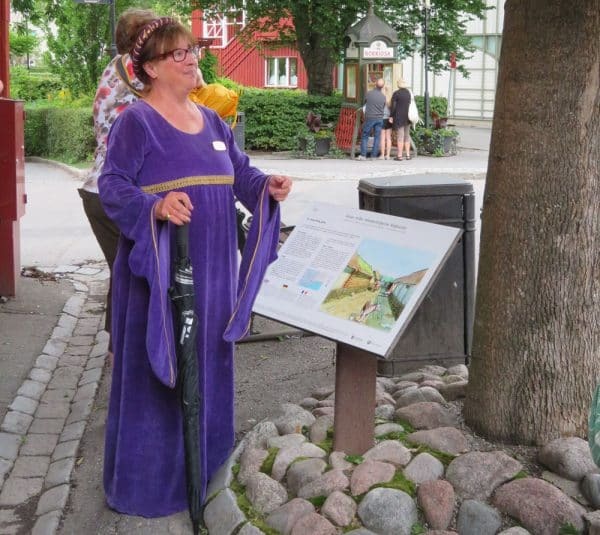 Guide in Sigtuna in Viking costume. One of the most fascinating things at the museum, though, is a lot newer — in fact, it’s made from a phone booth no longer required by the town. 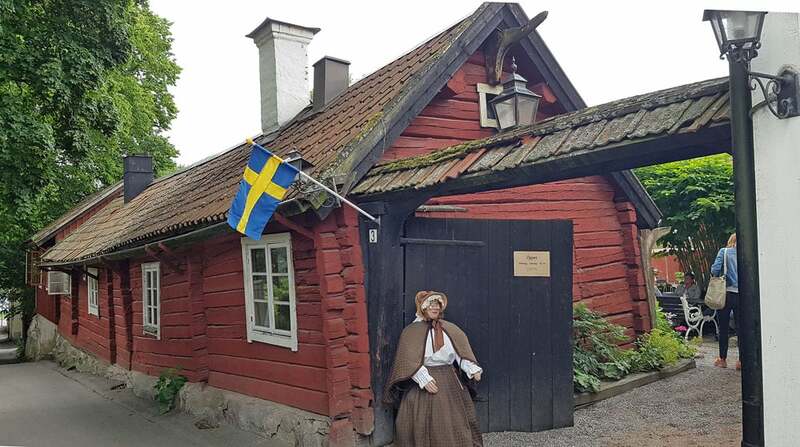 The compact little building has been made into Sweden’s smallest library, which you can read more about in this article! Runic stone erected by Anund to tell his own story. in Sigtuna. Viking runes, or runestones, serve somewhat the same purpose as a tombstone — or perhaps a millennia old selfie! Indeed, the stone carvings were created by people who had something they wanted remembered in a time before books served that purpose. The custom came to Sigtuna from Denmark, although many of the Scandinavian runestones are in Sweden, where you’ll find over 3000 inscriptions. Click here for a PDF walking guide to all of the runestones in Sigtuna. Stories on the runes are of both men and women, pointing to a greater societal female role in the Viking era. In order to make sure the stories didn’t disappear over time, the colors in the carvings were filled in periodically. 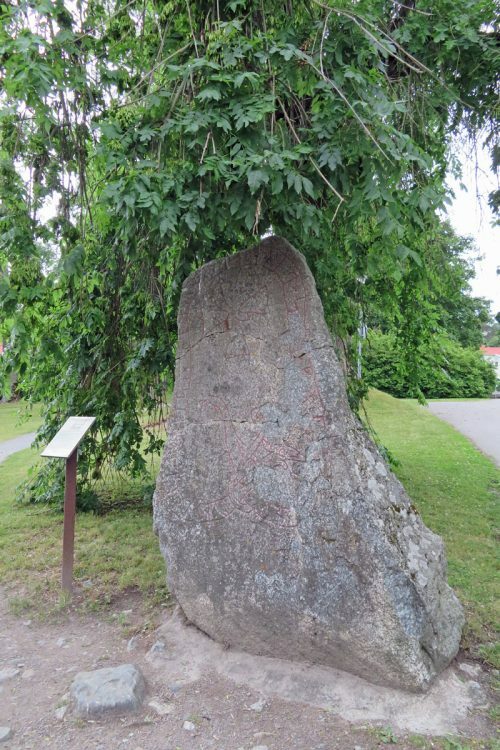 Sigtuna has more runestones than any other place in the world! St. Mary’s Parish Church of the town of Sigtuna, Sweden. 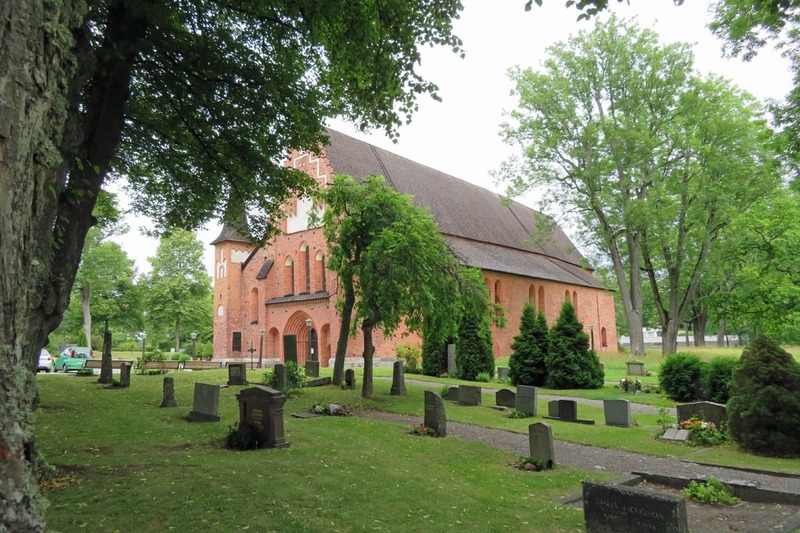 Sigtuna was founded to be the first Christian town in Sweden – the centre of the new religion. Today, several ruins of what were once beautiful old churches still stand throughout the town. St. Mary’s, however, is not only intact, but is still the parish church today. Built in the mid-1200s, it’s one of the oldest brick buildings in the Malaren Valley. Dominican friars built and used it until the Protestant Reformation, when monasteries were dissolved in the early 16th century. 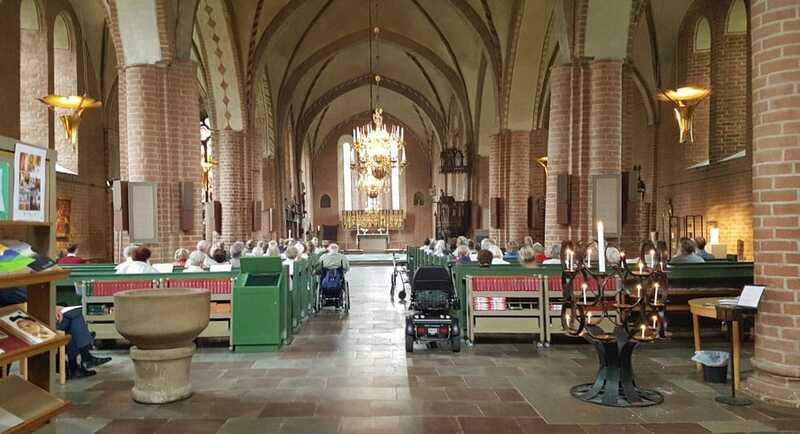 Musical concert inside St. Mary’s Church in Sigtuna, Sweden. During its early period under the Dominicans, the church had its own convent, taught the town’s children to read and write, and instructed local women in how to grow herbs and vegetables. The convent, however, disappeared in the 1500s when the king of the time tore it down and used the bricks to help build his castle. The day I visited, I quietly opened the front doors to eavesdrop on a free concert of Orgelfavoriter av Bach! In fact, St. Mary’s is open 365 days a day for services, concerts, and exhibitions. Sigtuna has the smallest town hall in Sweden, perhaps even in Europe! Much of what the town hall is today is the result of work that 18th century mayor, Eric Kihlman, did to restore it beginning in 1744. The two rooms have served the town in various capacities, even being the jail cell until the 1930s. Today, it’s a quick walk around to see the interior, but don’t miss the stories told along the walls. Interior of the Sigtuna Town Hall. It seems that in the early 1800s about 300 people lived in town, but there were 16 bars. Perhaps the spirits of those ancient Vikings were doing more than resting in peace. At any rate, the story goes that a man who’d been making his way down the street left his final bar, and didn’t want to go home to face his wife. So, he simply grabbed the key to the jail cell, which was always stored behind the wooden shutters, and let himself in for the night to sleep it off. Smart guy! Tant Bruns Kaffestuga restaurant in Sigtuna. 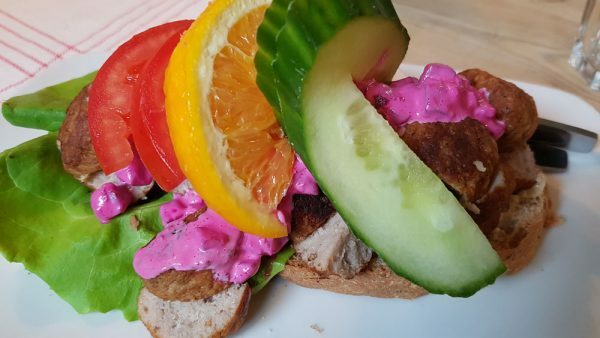 Auntie Brown’s Cafe was one of my favorite stops in Sigtuna! The plump little lady mannequin at the entrance reminded me of the story of the teeny-tiny woman who went out for a walk in her village. She had me hooked. I had to see more of this centuries old building. Inside, the building is divided into several teeny-tiny rooms that create a cozy atmosphere — and not much room to move. 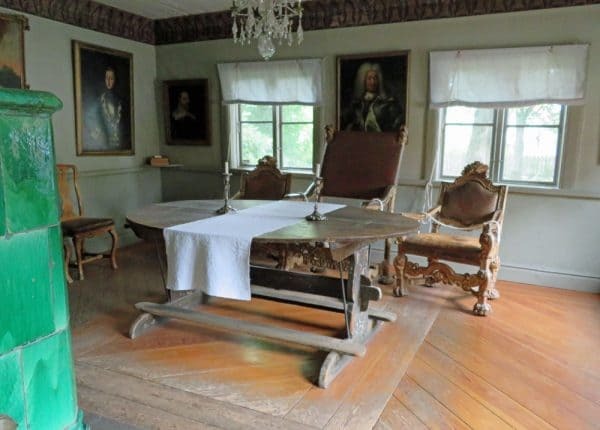 The food, as you might expect in such a traditional setting, is some of the best of Sweden. In fact, Auntie Brown’s is recognized as one of Sweden’s best cafes and bakeries. Lunch, however, wasn’t a teeny-tiny bone as in the story of the teeny-tiny woman, but delicious Swedish meatballs, served cold with a garnish of cucumber, tomato, and orange, plus a beet sauce. Yum! If you enjoy wandering through quaint little shops with out-of-the-ordinary things to look at, you’ll love shopping in Sigtuna. Stora Gatan is the main shopping area, and it’s just a block or so to Auntie Brown’s Cafe. From boutiques with women’s shoes and clothing, to books and chocolate, to mixes for local specialties, you’ll find lots of treasures in your shopping. And of course, there are also lots more coffee shops and places to relax and enjoy the seaside air. 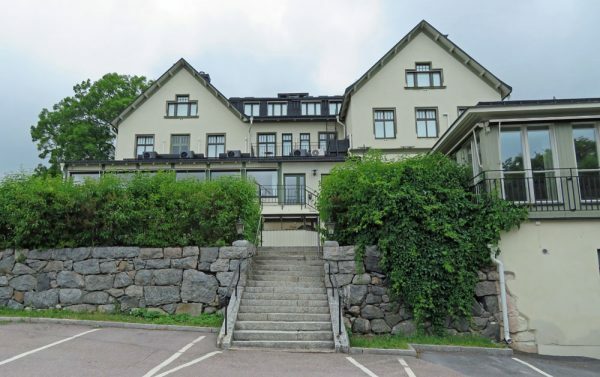 The Stads Hotell is situated on Stora Gatan, so convenient to shopping and dining. 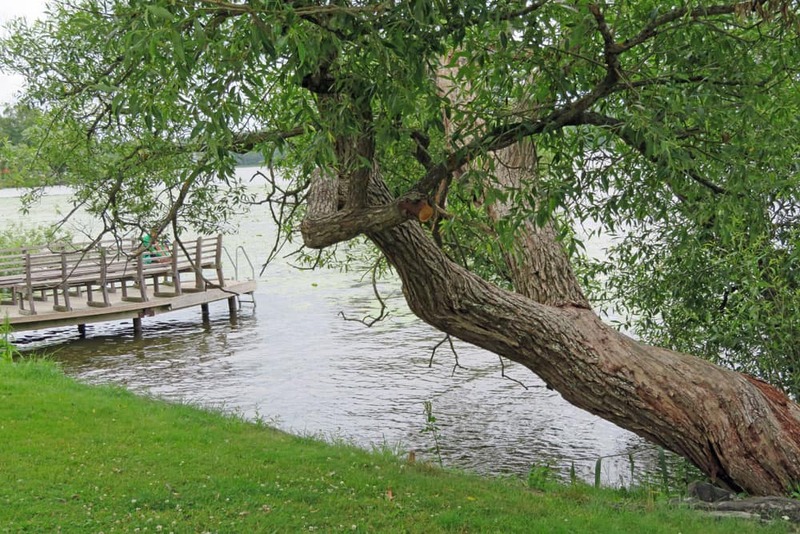 It was built in 1909 on the banks of Lake Mälaren, but has been renovated to modern standards while preserving its historic charm. You might not expect to find a 5-star hotel outside Stockholm, but the view of the water from the Stads Hotell is worth all five stars. The intimate setting and elegant furnishings are the perfect place to get away and relax when you’re in Sweden. Its restaurant has been rated as one of the top 20 in Sweden, so you know you’ll get some fine dining too. Lake and pier at Stads Hotell in Sigtuna.